Just because the warm boating weather is gone and the yachts have migrated South for the cold season doesnâ€™t mean that North Cove Marina has to languish as an unused dead zone in winter! 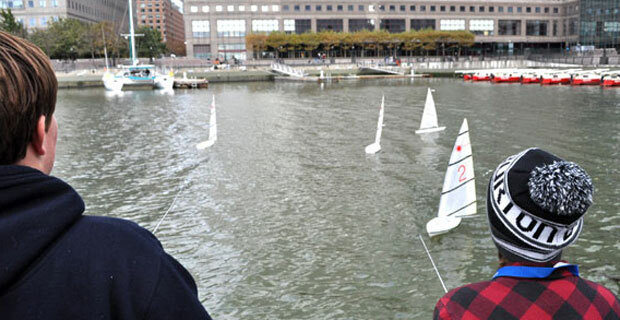 On Saturdays and Sundays, the marina is transformed into a mini race course for 10 radio-controlled Laser sailboats. The marina is open to the public at a cost of $5 per hour, which pays for batteries. A $20 security deposit is required, but then refunded at dayâ€™s end. Sessions are determined by demand. Interested â€œboatersâ€ are urged to make an advance reservation in order to confirm a boat. If you do not make a reservation, boats will be available to you on standby. Details are as follows: Upon arrival at North Cove, people should check in at the Dock Master booth, located on Dock H and access an RC Laser from the Laser Guru after filling out a form and submitting a deposit. There is also a Race Guru in charge of competitive boating. Race results will be recorded. Do you plan to visit the North Cove Marina to operate a radio-controlled boat?